It’s been a rough few months for everyone. Women and minorities have particularly felt the heat, but once Trump enacted his “Muslim ban” this past weekend, along with the shooting of six Muslims in a Quebec mosque, everyone began to understand that this a time when serious action needs to be taken in order for all of us to retain our rights. So now what do we do? It’s easy to feel helpless because this isn’t just a Trump problem, but a systemic one that has surfaced to those who usually aren’t affected by racism, sexism and overall bigotry. How do we help the Muslims at Dal, in Halifax and in Canada feel safe? How do we help stop the inevitable slew of racism that is about to come upon our fellow Muslims, and likely other minority groups? How can we help? We at the Gazette don’t know the answer. I’m not sure if anybody does. After talking to the Dalhousie Muslim Student Association, we put together a list of a few things that you can do right now. And in the coming weeks, get ready to get educated about Islam, Muslim students on campus and the struggles these students face on a day-to-day basis – all right here on the Gazette website. We want to know how you’re feeling about the bigotry happening across the world. How has Trump’s “Muslim ban” affected you, your family and your friends? Note that you don’t have to be Muslim to answer this question! The ban targets citizens of Muslim countries, but everyone is feeling affected in some way or another. If you’re Muslim and filling out the survey, let us know! We’re trying to gather information about Muslims on campus so that we can understand the needs of Dal students (spoiler alert: we’ll let the administration know how many Muslims are on campus to advocate for more resources for Muslims, like better prayer spaces and more halal food). Donate – money OR time OR both (if you got them expendable dolla dolla bills). Okay, okay, I know you probably don’t have any money – don’t worry, I don’t have any either. However, I have taken the few dollars I would usually give to Tim’s or Pete’s (if I’m feeling rich that day) and given it to the American Civil Liberties Union, who are out suing Trump on the ban, amongst other things, and are doing a damn fine job at fighting Islamophobia and racism. Also consider donating to the Immigrant Services Association of Nova Scotia, who help refugees settle into Nova Scotia and advocate for their rights. You can even make your donation specific to helping Syrian refugees (one of the countries whose citizens are banned from entering the U.S.). You can also volunteer with various organizations here at Dal to help make a difference! Enactus, a social entrepreneurship club, has a program called the SyriCan Network, which connects Syrian newcomers with professional resources. 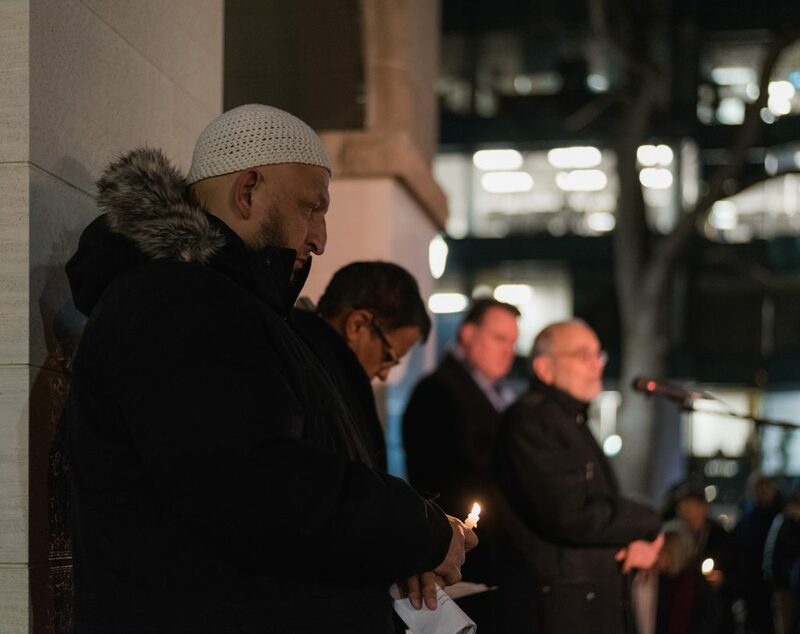 The Dalhousie Muslim Student Association organizes events to educate Dal students about Islam, like holding the vigil for the five Muslims murdered at the Quebec City mosque. You can start something new and bring it forward in March, which is Muslim Awareness Month. A vigil at Grand Parade for five Muslims who were killed at the Quebec City Mosque Shooting on Jan. 29. Contact your MP or MLA to let him/her know that Canada should condemn the U.S. ban on Muslims and continue to welcome Muslims and refugees from Muslims countries into Canada. The Strand, the student newspaper at Victoria College at the University of Toronto, was kind enough to let us share their customizable letter to send your provincial or federal representative condemning the “Muslim ban.” Strand editor Celeste Yim created a letter which asks your representative to “advocate and strive for the immediate entry of those stranded in limbo,” repeal and replace the Safe Third Country Agreement, repatriate all Canadians impacted, and “publicly denounce President Trump’s executive order” and reaffirm “Canada’s commitment to refugees.” Sounds like it covers everything, right? Read it here, customize it and then send it! We know the list isn’t massive or easy, but these things will help. We can’t simply do nothing, so we must do something. Email editor@dalgazette.com if you have more actionables to add to the list.